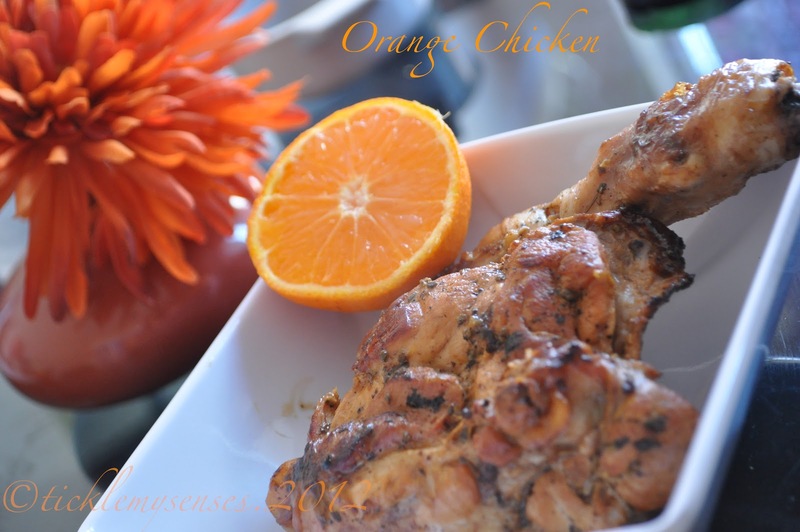 If your little one loves oranges and chicken, and is not quite used to spicy food yet, then he or she is sure to love this super easy, mildly flavoured, combination of oranges and chicken. I have used sage for flavour and a pinch of black pepper for spice. An added squeeze of fresh orange juice just before serving enhances the oranginess of the dish. Small orange/ clementine: 1 medium size. 1. 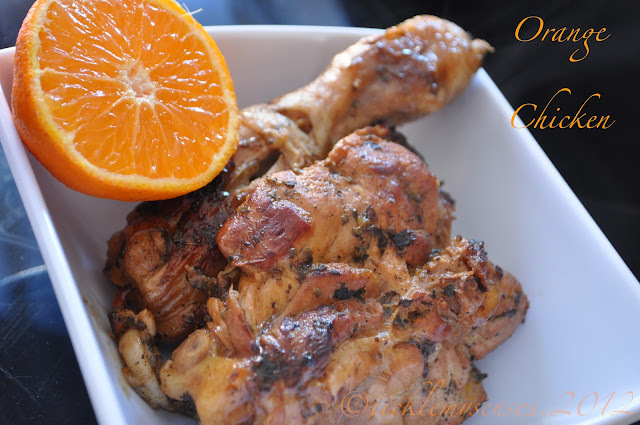 Prepare marinade: freshly squeeze orange juice into a bowl, add salt, pepper and sage. Taste to make sure the seasoning is right. 2. Slit the chicken in 2 -3 places using a knife, to allow marinade to penetrate meat. Marinade the chicken pieces, keep bowl covered, leave overnight in the fridge. 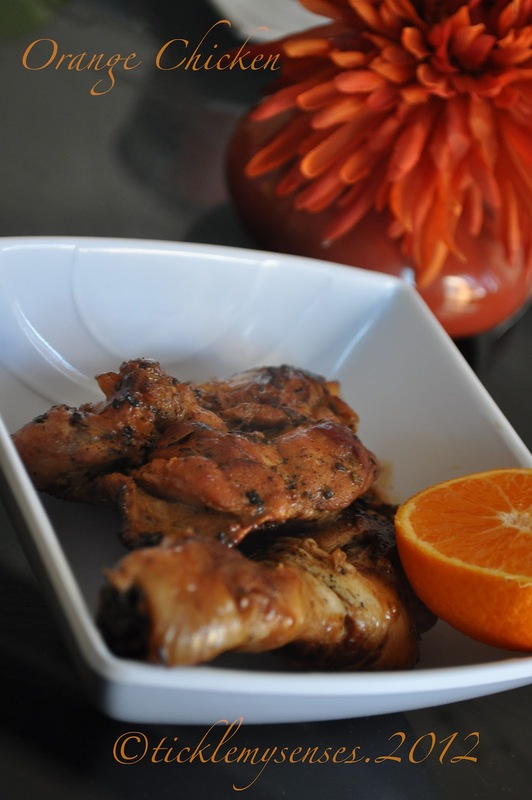 If short on time leave the chicken in marinade for a minimum of an hour. 3. In a non-stick pan heat oil. When hot add the chicken pieces to the pan (without any marinading juices from the bowl), fry on high heat for a few minutes on one side till the skin turns brown, turn and brown the other side. Then add 1/4- 1/2 cup of water to the marinading bowl and add to the pan, turn the heat down to medium and allow the chicken to cook covered, turn half way through to allow other side to cook. Once done allow all the gravy to dry up. Squeeze over a bit more fresh orange juice just before serving. Serve along with buttered mash potatoes and a portion of steamed carrots and beans. I prefer to use chicken with skin on while frying, keeps the meat moist. You could remove the skin after chicken is cooked if you prefer or serve as is. wow.. new to me.. never tried orange and chicken together.. sounds too good.. Awesome looking chicken..What a nice flavor it should have acquired.Thanks for posting.